It has been a while since I last posted a trading analysis, especially on the commodities side. Im my last article, I walked you through my thoughts on the GBPUSD and Brexit. In this article, I wanted to share my observations with you on Gold. 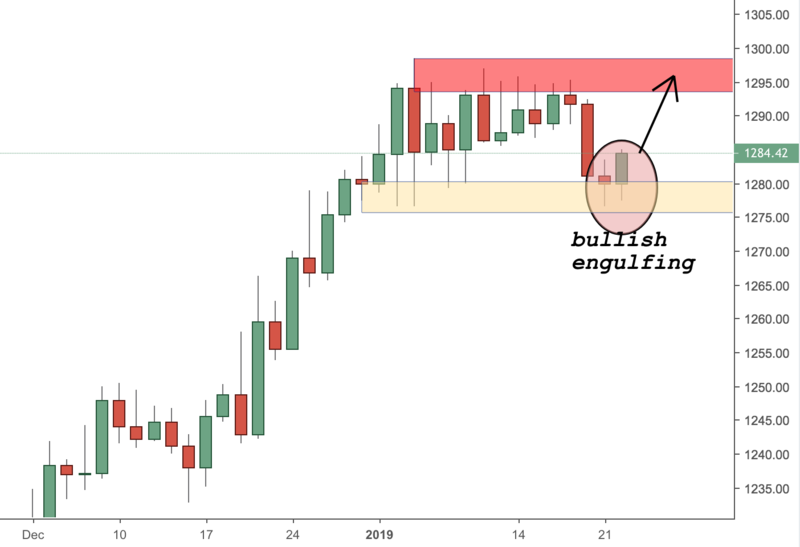 I am seeing a bullish engulfing pattern on the daily chart from yesterday (bear in mind that the screenshot was taken last night but I didn’t have the time to upload it). There is a minor support level at 1280, which plays a good role as a level of demand. I am looking at the level of 1300 and can see a lot of sellers concentrated there. So, I will be careful in case I take a long trade around this level. Currently, I am waiting for a 4H confirmation candle if I am about to take a long or not. If such candle does not occur, I will be waiting for price to re-test the 1280 level and show me another confirmation or rejection, so I can take the necessary action. Gold has entered a resistance zone, last weeks candle looks like it may be an exhaustive one. We shall see if this weeks candle ends up closing as an inside one. Gold made an exceptional run up, hat’s off to those that got on board. Ironically it has reached the FE of 1.618 perfectly. This being just an observation but interested to know if anyone actually used it prior/ My opinion on Fib and FE : if you put enough lines on a chart sooner or later price will line up with it, so a bit subjective but very ironic the price turns at 50% or reaches popular FE levels. Maybe the algos are using it ? Hi Dan, you are right, but this rejection is not on a major resistance area. The major area in my opinion is between 1360 and 1375. It looks to me like a consolidation before more buyers join the rest. Yes I agree now as trend is up … more likely the locomotive will continue.